Wanted by the Chilean authorities, poet and politician Pablo Neruda goes on the run. The biopic is a tricky prospect. Usually the selling point of such movies is the veracity of the subject matter, the dread boast that the film is ‘based on a true story’, and that therein lies its inherent worth. So, it is the presentation of historical accuracy, rather than the creative imaginings, constructed drama and visualisations that characterise fiction, which is the audience attraction for biopics. They’re sort of movies that people who don’t normally go to see movies watch, with the biopic remaining the mainstay of Oscar-bait; ‘worthy’ pictures which present themselves as improving and so-so educational. And those are just the ones about people whose lives are at least half way interesting (Nelson Mandela, Johnny Cash, say). But how on earth could the life of a poet, a person who spends most of their life locked in deep contemplation and the other half scribbling down their observations - be rendered in any way dramatic? While their words may have been exceptional, their lifestyle (all that drafting and redrafting and looking up spellings in the dictionary, etc) probably wasn’t. A case in point is Jane Campion’s Bright Star, set during a period wherein some of the most exciting arrangements of the English language ever were inked, but wherein the prosaic facts of creative circumstance reduce us to witnessing Ben Wishaw’s glum Keats mooching about in picturesque drawing rooms and delicate gardens, and occasionally chasing after Fanny (Abbie Cornish) in a doomed romance narrative which is as dull as a wet day in autumn. Like Todd Haynes’ I’m Not There however (another flick about the life of a left-wing poet), Pablo Larrain’s Neruda takes a more inventive approach to presenting the mercurial life of its subject. And, what’s more, the life of Pablo Neruda, a genius poet, is fascinating to begin with. Neruda’s words were beautiful to many yet considered dangerous to a crucial few. A poet who actually meant something to the people, Neruda also occupied many diplomatic positions within government, most notably serving a term as a senator for the Chilean Communist Party. We come in as this position is cut short when communism is outlawed, and Neruda is forced to go on the run (IRL Neruda was, it would seem, eventually assassinated on Pinochet’s orders). The stuff of ready-made legend already, but Larrain’s film aptly honours Neruda’s existence - which blended art, political existence and ideology - with a playful, almost metaphysical approach. 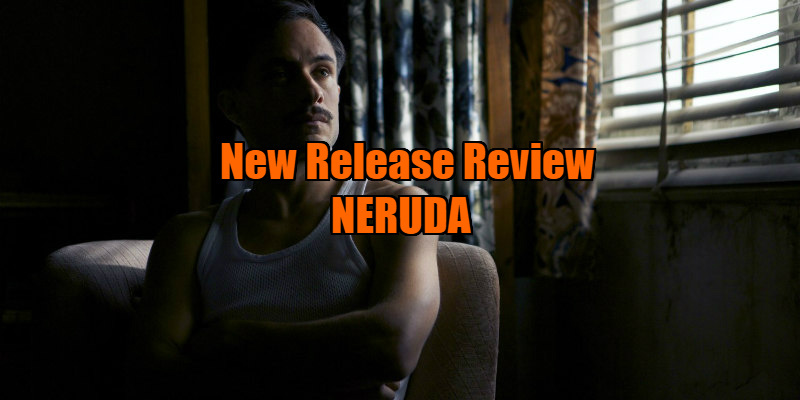 Gael García Bernal plays an inspector who tracks Luis Gnecco’s poet as he ekes out a clandestine existence in 1940s Chile. The story is told through Bernal’s narration, which has the introspective inflection of the period’s noir voice overs. Embittered and cynical, buttoned down and envious, the inspector is a binary opposition to the libidinous, lefty poet and the film becomes a quarrel of creeds, with Neruda suggesting that each ideology cannot exist without the other. Larrain recreates the era in lavish detail, from the historic iconography to the brutal background of Pinochet’s regime. We see workers brutalised and herded at gunpoint into the backs of trucks by men in uniforms, people living in fear, but whose imaginations at least are emancipated by poetry and the beauty of Neruda’s stanza. At several points, we witness the incendiary precision of his verse, proudly read aloud by several different voices, as poetry always should be. ‘In this fiction, we all revolve around the protagonist’ Neruda’s wife Delia (Mercedes Morán - magnificent) ruminates, and, true to her word, Neruda’s (who is depicted here as a flawed individual, a champagne swigging shagger who’s partial to the finer things in life) importance is conveyed by his influence on the world around him and the hope he inspired. This is no more evident than in Bernal’s Ahab figure, whose impotency and own musings - ‘the communist is always late to work… he fills his mouth with talk of peace’ - consolidate what Neruda stood, and eventually died, for. But even this, the film suggests, is a possible construct, with Neruda taunting the inspector with gifts of detective novels which in turn serve to inspire the hard-boiled existentialism of his narration. While rooting itself in fact, Larrain’s biopic uses deliberately cinematic and literary approaches to imbue the life and work of its poet with resonance and meaning. In Neruda, with its reflective narrative, and dynamic visuals, it is the word which is the truth, and love its salvation: Si nada nos salva de la muerte, al menos que el amor nos salve de la vida. 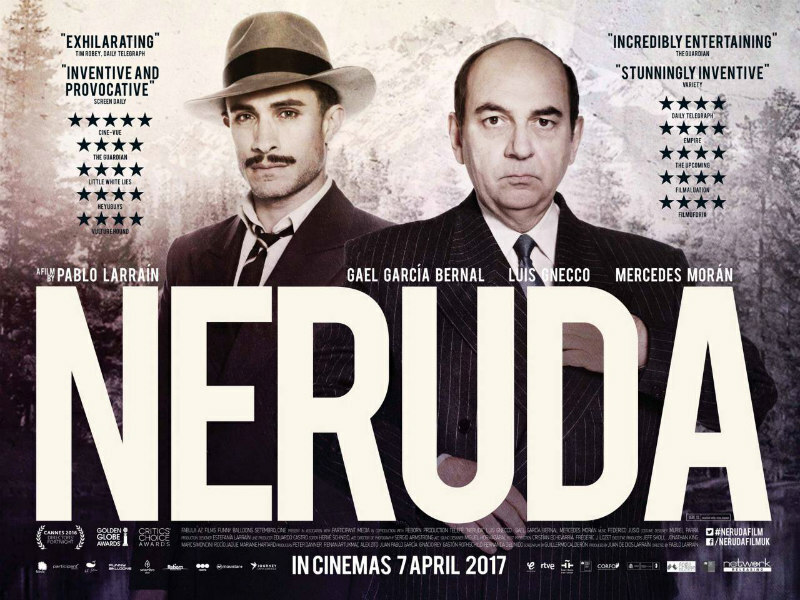 Neruda is in UK/ROI cinemas April 7th.